This is a well-programmed, finely played and valuable disc – qualities that could be used to define the English Music Festival itself. Whether on violin or viola, Marshall-Luck plays with ideal purity over the widest range, important in both works when high harmonics are involved. 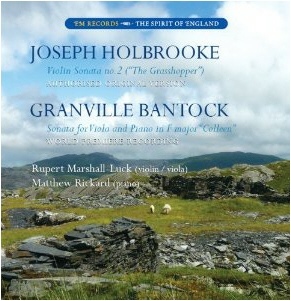 Matthew Rickard’s piano-playing is also impressive, notably in the flamboyant writing in the Bantock. Matthew Rickard is [Rupert Marshall-Luck’s] fine sonata colleague and he expertly propels the piano writing [of the Holbrooke] which is powerful, strong and highly effective.